"The 3rd Line Infantry Regiment. The Grenadiers can be instantly recognized by their red cords, facings and white gaiters. The Voltigeurs (skirmishers) by their yellow and green cords, facings and black gaiters." For several years (1803-1806) Napoleon’s Armies suffered an amazing shortage of horses… This meant that some cavalry units and Regiments were forced to fight on foot. Perhaps the most famous were the Dragoons. 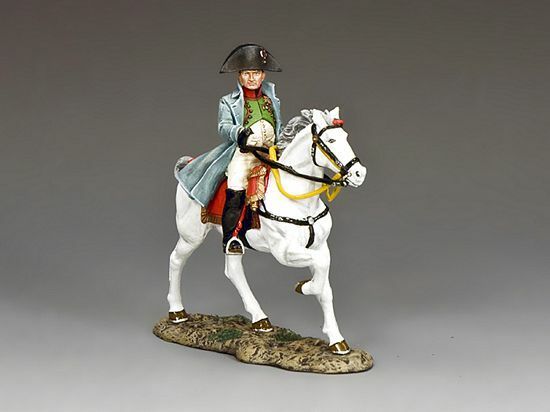 Originally formed as mounted infantry the Emperor decreed that the Dragoons would be better suited to fight as dismounted soldiers than any of their cavalry compatriots. Although they never liked losing their horses the Dragoons performed admirably in this new role for a limited period. After all, the Emperor’s orders were… the Emperor’s wishes! Retired By King & Country April 2015! Order Now Availability Very Limited! Retired October 2018! Limited stock Order Now!